Set clearly in the changed context of the 21st century, this major new text provides a comprehensive analysis of the foreign policy of the European Union assessing the history, actors, processes, partnerships and rivalries of this key area of EU policy. STEPHAN KEUKELEIRE holds a Jean-Monnet Chair in European Foreign Policy and is Director of the Jean Monnet Centre of Excellence "The EU, Foreign Policy and Global Governance" at the Catholic University of Leuven (K.U.Leuven) and Visiting Professor at the College of Europe in Bruges (Belgium). 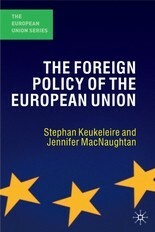 JENNIFER MACNAUGHTAN was, at the time of writing, Head of Office for a Member of the European Parliament.